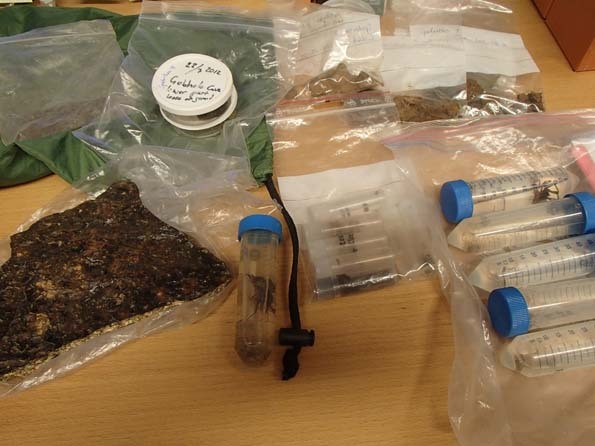 Some of the samples we brought with us from Gobholo Cave. Being back home does not mean that the expedition is over. Far from it. Now it is time to start writing the expedition report, travelogues, planning for next expedition, and most exciting of all: start to distribute and investigate the samples we brought back with us. (OK, most exciting of all is the exploration of the cave…) We have with us 11 bottles with alcohol preserved animals (kids, take lesson, alcohol can kill, especially if it’s 70% and you are submerged in it), 7 boxes with speleothems, and one sample of the granite weathered surface found in the bottom of the cave. The animals I hope to be able to find experts willing to determine/describe (we have spiders, opiliones, cave crickets, springtails, and small insects with wings…), the speleothems we will share with Juan Ramón and his research group in A Coruña. Here in Stockholm we have access to E-SEM (Environmental Scanning Electron Microscope; in the E-SEM we can get a view of the crystal morphologies, patterns, and microorganisms present on/in the speleothems, as well as determine what elements are present in the sample) and X-Ray diffractometer and other equipment for mineral analysis. Back in Swaziland we also have a collection of pottery fragments, that have been found scattered in the cave (only pieces not “in situ”, or in danger of beeing destroyed by visitors have been brought out of the cave). Some of them have traces of what looks like organic material still attached, and would perhaps be suitable for C-14 dating. The adventure continues!